Looking for success but not quite got there yet? Think you have most of the answers but there's something not quite happening right? Are you fed up with life not giving you what you'd really like? There are ways of understanding life that really help your success. the key to understanding life? Don't see life as what you want or do. See it as what you experience! your three life power resources? your two main life perspectives? your four types of life experience? your three ways of expressing life? the three main concerns in your outer life? the two main concerns in your inner life? Get a FREE copy of my 'Bits' report when you sign up for the Success Alert newsletter and you'll get a double shot of Success Support. 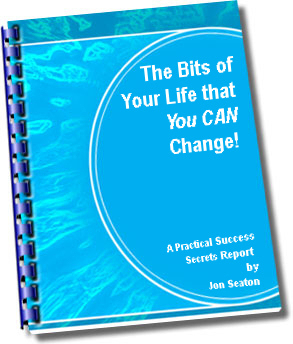 The free 'Bits of your Life that you Can Change!' report to give you a clear understanding of how a life of success needs a foundation. and lots, LOTS, LOTS more!